Who are these people on our ballot? The filing deadline is long past, and campaigning for the primary and general election is well underway. Democrats in Harris County have a fairly full complement of legislative candidates this fall, some of whom are better known than others. I thought I’d take a moment to look over the primary ballot list and see what I can find about the candidates who are challenging incumbents of either party. In particular, I’m looking to see if I can find a campaign webpage and/or Facebook page, plus whatever Google can tell me. I’m limiting this to Harris County and to legislative races not counting the US Senate. I may do more of these later if I have the time and the inclination. For now, let’s get started. CD02 – Niko Letsos: No webpage or Facebook page that I can find so far. Google tells me nothing. CD07 – James Cargas and Lissa Squiers – Both ran for this office in 2012. Their links from that year still work. CD10 – Tawana Cadien: Another repeat candidate from 2012. Her old website and Facebook page are still available. Interviews for all three of these candidates can be found on my 2012 Primary Election – Harris County page. CD22 – Frank Briscoe and Mark Gibson: Neither appears to have a webpage or a Facebook page yet. Briscoe is a candidate with some pedigree. He ran for CD22 in 2002, losing by a hair in the primary to Tim Riley. He’s the son of the late District Attorney and two-time Houston Mayoral candidate Frank Briscoe, Senior, and apparently a relative in some fashion of former Texas Governor Dolph Briscoe. Here’s an interesting Q&A with him in Architectural Record, which isn’t dated but based on context appears to be from not too long after his unsuccessful run in 2002. As for Mark Gibson, Google tells me there’s a Mark Gibson that was an independent candidate for Congress in Virginia in 2012. I rather doubt this is the same Mark Gibson – it’s not that unusual a name – but that’s what I could find in Google. CD36 – Michael Cole. Cole was the Libertarian candidate for CD36 in 2012 before announcing in August that he would run again as a Democrat. Here’s an interview he did with a Daily Kos member shortly thereafter, which includes links to all his relevant web and social media pages. SD07 – Jim Davis: Google tells me nothing. SD15 – Sen. John Whitmire and Damian LaCroix: Sen. Whitmire has served in the Senate for many years, but is new to the internets; his Facebook page was created on November 19. I’ve written about LaCroix before and will have an interview with him, and one with Sen. Whitmire, soon. SD17 – Rita Lucido: Lucido is a longtime activist and volunteer, and is the highest-profile challenger to a Republican incumbent among the legislative candidates. Her campaign Facebook page is quite active. HD129 – John Gay: No webpage or Facebook presence yet, but Google tells me that John Gay ran for CD14 as a Republican in 2012; he finished seventh in the field of nine. 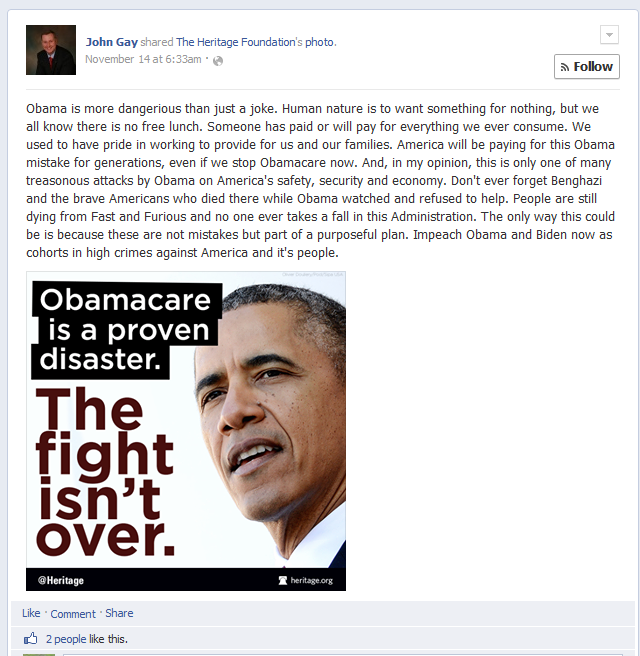 His campaign webpage domain (johngay.org) has expired, but via here I found his personal Facebook page, and while I consider myself to be open and welcoming to party-switchers, it’s safe to say that this guy is a problem. Here’s a screenshot from his Facebook page, so you can see what I mean. Barring a major and convincing change of heart from this guy, my advice is to not waste any time or effort on him. There’s plenty of other good candidates to support. UPDATE: Upon further investigation, it appears there are two John Gays, the one who ran as an R in 2012 in CD14, and the one who is running in HD129 as a Dem. The latter one does not have any web presence that I found at a cursory search, hence the confusion. I’ve got a business phone number for the HD129 John Gay and will try to reach him tomorrow to discuss. My apologies for the confusion. HD131 – Rep. Alma Allen and Azuwuike Okorafor: Rep. Allen has a primary challenge for the second straight cycle. Okorafor is a newcomer on the scene but looks like a good candidate. I intend to interview them both for the primary. HD132 – Luis Lopez: No web presence yet, and the name is too common for Google to be reliable. This may be his personal Facebook page. HD133 – Laura Nicol: No campaign webpage yet, but her campaign Facebook page is active. She and I have been Facebook friends for awhile, and I met her in person at an HCDP event a couple of weeks ago. HD134 – Alison Ruff: No web presence as yet. I’ve mentioned her on my blog a couple of times, and met her at HCDP headquarters a couple of weeks back. This is her personal Facebook page. HD135 – Moiz Abbas: I got nothing. HD138 – Fred Vernon: Another blank, though this may be him. HD145 – Rep. Carol Alvarado and Susan Delgado: Rep. Alvarado is my State Rep, and I consider her a friend. Delgado is a realtor, a multiple-time candidate, and the former mistress of the late Sen. Mario Gallegos. Based on comments she has left here and on her personal Facebook page, I think it’s fair to say mud will be flung in this race. For the record, I’ll be voting for Rep. Alvarado. HD150 – Amy Perez: The full complement – webpage, Facebook page, and Twitter account. Well done. That’s it for now. I may do a similar exercise for judicial candidates if I find myself with a few spare hours. You can also check out my new 2014 Election page, where I’ll be tracking contested primaries mostly but not exclusively in Harris County. If you think I’ve misrepresented anyone here, or if I’ve missed anything relevant, please let me know. Thanks. 1. Democrats have been urgently searching for a candidate to run in HD134. On paper at least, it’s a swing district, the kind of district Dems must win if they want to have any hope of making serious inroads in the House. 2. However it looks on paper, realistically speaking Sarah Davis would be a heavy favorite to be re-elected. Ann Johnson was a strong and well-financed challenger in 2012, but Davis won with room to spare. The district was lean R prior to redistricting, and it’s slightly redder now. All this has made Democratic recruiting efforts difficult, to say the least. I know of one person who has said No to the HDCC; it is likely there have been others. Dems do now have a candidate in Alison Ruff, but I feel confident that they will continue to search around until the filing deadline. 3. The equation does change if Davis gets knocked off by a teabagger in the primary. Unlike most House districts, it is possible to be too conservative for HD134, as Martha Wong could attest. If we knew for a fact that Davis would get such a challenger, and we knew for a fact that said challenger would defeat her, I feel confident that there would already be an HDCC-backed candidate in the race. So now that we know that Davis is being primaried, the next question is how likely is she to lose? I’m going to throw two sets of numbers out at you to help you decide. First is a look at how Republican State Rep candidates in Harris County did in their primaries in 2012. “Vote %” is the candidate’s share of the total ballots cast, so undervotes are included. I did that to be able to compare unopposed candidates with those who were in contested races. Among incumbents, Davis had the lowest share of the vote of anyone except Jim Murphy, who unlike Davis had an opponent. Dan Huberty, Debbie Riddle, and John Davis all had opponents but still took a greater share of the vote than Sarah Davis did. What this suggests to me is that Sarah Davis is not as popular with the primary electorate in HD134 as her peers are in their districts. That doesn’t necessarily mean that a teabag challenger would defeat Davis. So for some further information, I went looking to see how Ted Cruz did against David Dewhurst in the district in 2012. I pieced together the information from the primary and runoff canvasses. In the May primary, Dewhurst got a plurality of the vote, 49.78% to Cruz’s 40.80%; Dew missed a clear majority by 36 votes out of 16,105 cast. In the runoff, however, Cruz prevailed by a 53.09 to 46.91 mark, with 14,625 votes cast. This suggests that Davis could be vulnerable to a challenge from the right, though it’s not clear-cut. On the plus side for her, she’d likely be in better shape in a higher-turnout race, which this would probably be. On the minus side, all of the races that will get any attention will be from candidates that are trying to make Ted Cruz look like a treehugger. Honestly, if one of the statewide candidates doesn’t try to rip the still-beating heart from the chest of a rival candidate, I’ll consider it an upset. So I still don’t know how to evaluate this race. If Davis is the nominee, any Democrat is a longshot at best. If she loses, I’d say Dems at least have a chance to defeat Parker, with a suitable nominee and enough resources. It remains to see if Alison Ruff can be that candidate, but that’s getting ahead of the story. It’s hard to recruit for a possibility, especially given that a win automatically makes you the top target in 2016. This is a race to watch, starting now until the filing deadline. This is the marquee matchup in Harris County in November, at least so far. Kim Ogg, the only Democratic yet to announce a bid for Harris County district attorney, said Monday that most voters do not identify with a particular party when it comes to criminal justice races. “I think the race for Harris County’s criminal district attorney is potentially less partisan than other traditional legislative races,” Ogg said at her official filing at the Harris County Democratic Headquarters. The former prosecutor who ran Crime Stoppers of Houston from 1999 to 2006 also said recent gains made by Democrats give her confidence. [On Monday,] Ogg said she would return the office to the [“trace case”] policy begun by [Pat] Lykos, whose position was that a tiny amount, less than 1/100 of a gram, was not enough to be tested by the prosecution and defense. See here and here for the background. As you know, I support the Lykos “trace case” policy, so I am glad to see Kim Ogg take that position. I will be very interested to hear what she has to say about reviewing cases under the mandate of SB344 as well. In related news, I get a daily report from the HCDP about who has filed for what, and I can report that Judith Snively has filed to run for District Clerk. Snively was a candidate for Harris County Criminal Court #3 in 2010 and did us all the favor of defeating Lloyd Oliver for the nomination in that race. Incumbent District Clerk Chris Daniel has a primary challenger, Court Koenning, but I was not aware of any Dem running for this office until just recently. Two candidates for other offices that had previously made their intentions known, David Rosen for Treasurer and Traci Jensen for HCDE Position 7 At Large, have also officially filed, and Ann Harris Bennett, who will run for County Clerk, sent out an email announcing that she will file on December 7. All incumbent Democratic State Reps except for Harold Dutton have filed so far. Finally, we have our first two legislative challengers, as an Alison Ruff has filed for HD134 and a John Gay filed for the open HD129. I had been aware of another person looking at the HD134 race, though she has since decided against it, but Ms. Ruff is a new name to me. Anyone out there know anything about her? What will Council do about Prop B layoffs? Mainstream on CD07: Here comes another Bush?